The main part of this pendant light is made of metal and acrylic,canopy is made of metal. 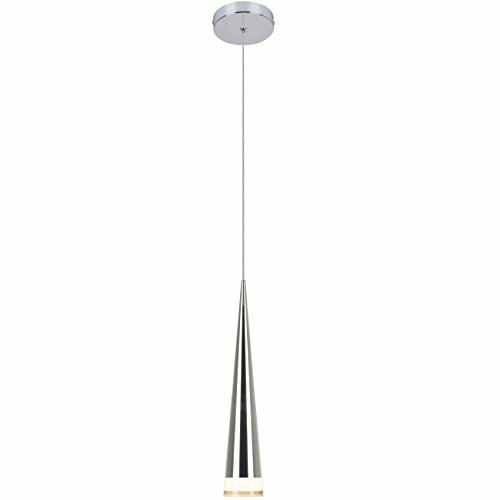 Height of lamp body is 12.6 inch, diameter is 2.4 inch, the length of rope is 16 inch,it can adjust according to your request. The total power is 5W.LED bulbs are a lot brighter than other light bulbs under same power,so save energy. LED bulbs.There are many LED bulbs,they are embedded,can not be replaced.But please do not worry,their life is very long,almost 50000 hours,if there are any problems within 2 years,please contact us,we will solve it.Usually if it is out of work,only driver is broken. This pendant light is suitable for the living room,dining room,bedroom and foyer,but this is just a suggestion, you can according to your actual needs to choose where is installed in. If the pendant light is damaged when you receive the goods,Do not hesitate to contact us by message,we must reply you within 12 hours.If you have any other problem about the item,you also can email to us, We are willing to service for you. Light color:The white color is nature white.Item color:silvery. Product Dimensions:30x2.4x2.4 inch,height adjustable.Suggested Space:Living room,bedroom,dining room and foyer. Voltage:120V for North America.Power: Max 5W(bulbs embedded).LED bulbs are a lot brighter than other light bulbs under same power,so save energy. If you want to have more lightings to choose,please click our brand name "Unitary".